On Sukhumvit Road and directly opposite what’s considered Bangkok’s very first high-end shopping mall, The Emporium, soars super-luxury EmQuartier. 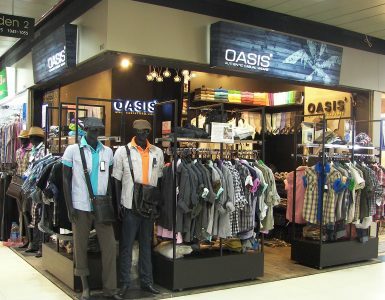 You’ll find here not only a world-class shopping experience but also many leisure opportunities. Along with designer and high-street brands at its many shops and stores, EmQuartier also offers visitors an incredible variety of food and drink outlets, in addition to entertainment options such as a luxury cinema experience. 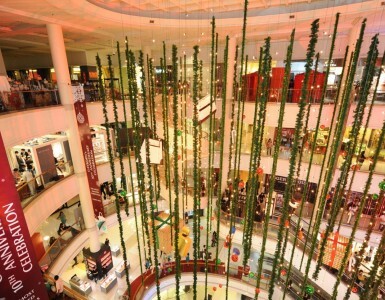 The mall’s design and décor likewise entertain the eye with spectacular features such as indoor waterfall, vertical garden and mesmerising audio-visual presentations. Ground to level 4 includes luxury-brand clothing and accessory shops, beauty and salon services, IT outlets, and more. On the 5th floor is a building highlight, Helix Water Garden, and from here a pathway spirals upwards all the way to a rooftop garden. Along the pathway are several restaurants and cafés. Back down at basement level, Helix Quartier features Thailand’s first automated parking system at a shopping mall. An eye-catching structure inside and out whose glass features and accents create stunning visual effects. High-street fashion retailers, a fitness centre and food park are prominent among shops and services, with the building’s middle floors primarily comprising high-grade office space. Certainly a highlight in every sense is 45th-floor Sky Cliff rooftop restaurant, in addition to private lounge on the same floor. There’s even a helipad – so definitely not your everyday shopping mall. Featuring Asia’s highest artificial waterfall, descending from the 4th floor to Ground level and then flowing on to buildings A and B. Commercial sites include shops and markets for a wide range of goods and wares, sport equipment/apparel outlet, as well as banks and multi-screen cinema. Another prominent feature is the building’s three-storey-tall LED screen. 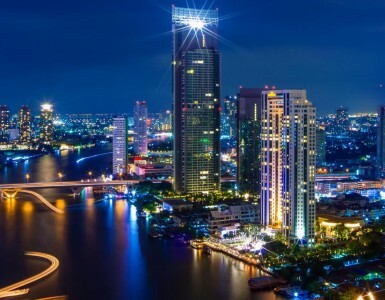 You can easily reach EmQuartier from Novotel Bangkok Ploenchit Sukhumvit by taking BTS SkyTrain at Ploenchit Station three stops to Phrom Phong Station. An elevated walkway connects directly to The Emporium shopping mall on opposite side of Sukhumvit Road. EmQuartier and The Emporium are open every day from 10.00 a.m. to 10.00 p.m.